The MIT Symphony Orchestra delivered a very enjoyable performance on Friday evening, despite the loss of its regular conductor, David Epstein, only a week before. 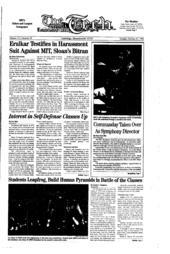 Epstein was involved in an automobile accident which left him unable to conduct the symphony. He will return to his conducting position next term. The first piece performed was Giuseppe Verdi's Overture to "La Forza del Destino." The low brass are prominent here, and the symphony's brass section succeeded and failed within the same piece. When playing alone, they had a beautiful, warm tone. When playing over the strings, however, they lost their clean intonation. The strings performed marvelously. Next, the symphony performed Maurice Ravel's Shhrezade. The biggest problem with this piece was its lack of balance. The soloist sang beautifully, but had problems competing with the orchestra in an arena the size of Kresge. The violins also seemed to hold back considerably, perhaps in deference to the soloist, or perhaps to counterbalance the 30-to-7 ratio of violins to cellos, which is larger than that of a standard symphony orchestra. In any case, the violins had a thin tone, which detracted from the Shhrezade. Works by Ravel should generally be lush and warm, in keeping with Ravel's turn-of-the-century France environment. The french horn section, composed of only four musicians, played extremely well for its size. The english horn also played well and blended superbly with the soloist. The showstopper was Ludwig van Beethoven's Symphony No. 3 in E flat, Op. 55 Eroica. The 50-minute piece was on the whole well-played and even fun to listen to. When the symphony was playing all together, it had a rich, majestic sound that filled even the remotest corners of Kresge's expanse. When smaller sections played, however, it was apparent that some were not comfortable with their parts. The most glaring example of this was the horn section in the third movement. The same group that played so well in the Ravel piece sounded as though it was groping through the mud in the french horn choir's solo sections. The violin section also ran into intonation problems in the second movement. The statement of the theme at the beginning of the fourth movement was extremely well played, however. Pizzicato strings and the winds engaged in call and response for a chilling effect. Overall, this was a very enjoyable concert. The symphony tackled some challenging works and succeeded very well, and Commanday did an impressive job considering the short time he had rehearsed with the group.